You can easily pass IASSC Lean Six Sigma Green Belt (ICGB) Certification with the help of our online practice exam. We are here to help you every step of the way to pass your IASSC Certified Lean Six Sigma Green Belt exam. Our team of experienced and certified professionals with more than 12 years of experience in the field of Business Process Improvement has designed practice exam to prepare for IASSC ICGB certification. They have carefully maintained exam structure, syllabus, time limit and scoring system same as the actual IASSC Certified Lean Six Sigma Green Belt exam. Our IASSC ICGB question bank contains most frequently asked and real-time case study based questions prepared by collecting inputs from recently certified candidates. To get familiar with our online IASSC Lean Six Sigma Green Belt certification practice exam environment, we invite you to try our sample practice exam to build the trust between us. All the questions covered in sample practice exam are basic IASSC Certified Lean Six Sigma Green Belt Certification exam questions. To test your knowledge and understanding with the real-time case study based questions, we strongly recommend you to practice with our Premium IASSC Lean Six Sigma Green Belt (ICGB) practice exam. 370+ Practical and Real-time Case Study Based Practice Exam Questions similar to actual IASSC ICGB certification exam and their correct answers for assessment. 2 Months Unlimited Access to online IASSC Certified Lean Six Sigma Green Belt (ICGB) certification practice exam. Price is just $36.80 USD which is lowest compared to any other offline or online materials. Our structured and autonomous review system collects feedback from recently certified candidates, based on those inputs our domain experts frequently update IASSC Lean Six Sigma Green Belt test questions for practice. Our online practice exam is a simulation of the actual IASSC Certified Lean Six Sigma Green Belt exam that makes you familiar with actual exam environment and exam pattern. We offer unlimited practice attempts with our online practice test. Every attempt randomly populates questions from our premium IASSC ICGB question bank that contains 370+ most probable case study based questions prepared by our domain experts. Practice questions will be served in random order with shuffled multiple choice answers to make your IASSC Certified Lean Six Sigma Green Belt exam experience more challenging. You can review the results of past practice attempts from result history and assess your performance. Such facilities are the significant advancement over questions in ICGB PDF and far better than fraud dumps sites. According to our survey with IASSC ICGB Certified candidates, you can easily score 80% in the actual IASSC Certified Lean Six Sigma Green Belt exam if you can score 100% in our online practice exam. first of all i'd like to specify that before i've practice with this website i had no idea how the exam would have been. Some of the question during the exam were really close to the one here during the practice. And the others that were not the same were MUCH easier after the practice done here. 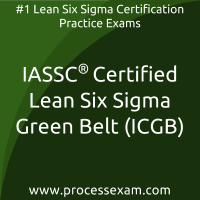 Overall I would highly recommend the process exam practice tests for the IASCC Lean Six Sigma Green Belt Certificate. I found the practice tests really helped highlight areas I needed to study and look back over. It helped focus my study and preparation from the E-Careers online course. I found the course helpful but it didn't have enough practice questions. These practice exams helped me complete the real exam and I am now certified! The practice questions are very similar style and it helps to practice with the timer counting down. Would highly recommend. With more than 370 practice questions in the ICGB simulated practice tests, i got the ability to appear for the IASSC Lean Six Sigma Green Belt certificate exam fearless. The specified time limit made me brush up my skills in managing time while answering questions. I very much liked the way that the mock tests are available at a reasonable price, that too online. I generally don’t recommend anything unless and until i am sure. But am very sure of IASSC Certified Lean Six Sigma Green Belt exam and the mock tests that i found online to practice for the same. I feel good that i found out time to recommend them as after clearing the exam i became quite busy with the projects and touchwood i feel good. How could i say no to this! There is so much to look forward to every IASSC ICGB practice test that i could not resist giving at least one on a daily basis every day while preparing for IASSC Lean Six Sigma Green Belt certificate exam.